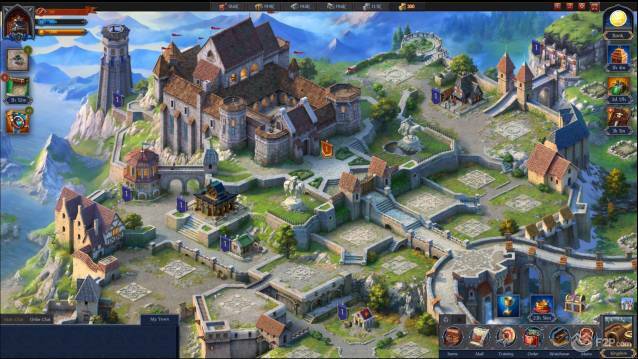 First Impressions on Throne: Kingdom at War- This week we have been playing Throne: Kingdom at War, the new free to play browser MMO from developers Plarium where we took on the role of being some medieval lord in charge of our own castle and holdings, tasked with progressing our city, raising a military and competing against other players in PVP to become the dominant force in our Kingdom. 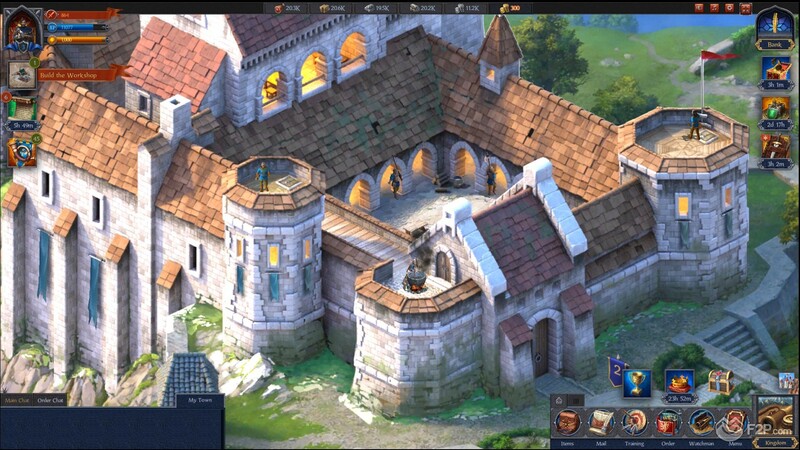 The game has only just been released but for anyone who has played a game by Plarium before, then they will be more than familiar with the features and gameplay on offer, offering up what the developers consider to be their “tried and tested formula”. Stepping into the game the first impressions are set by the graphics, which are as stunning as ever and the team do a really good job of making the town screen come alive, with flowing water, little soldiers marching along the palace walls, units training in the barracks; the animations and graphics look fantastic and follow in the style they first introduced with Nords: Heroes of the North, and later Vikings: War of Clans. Oddly, and this may be due to the game being optimized for mobile accessibility, at the closest zoom level the graphics lost a lot of fidelity, went quite pixelated and blurry, and just did not have the quality we have come to expect. In contrast, the transposition to the Kingdom map is extremely well done and the graphics there are probably better than what we’ve seen in any of their previous titles. The format is very much the same as their previous titles, frustratingly so as it really doesn’t feel like you’re playing that different a game if you’ve already experienced the others; especially given that Throne: KaW follows a similar fantasy/medieval theme that the others also had. We could quite easily focus on the negative aspect how this game really isn’t that different from the others, and all it looks like honestly is a way for people to enjoy the same game but starting again in a new MMO to try and get ahead, albeit there are a few tweaks here and there. However, taking the game in its own right and not focusing on how similar it is we have to say that Throne: Kingdom at War is very hit and miss and players will likely love it or hate it. The initial portions of the game follow a guided quest element that acts a tutorial with an NPC guiding you through things, but after a few quests she disappears and the gameplay carries on unassisted, albeit the quests are constant. 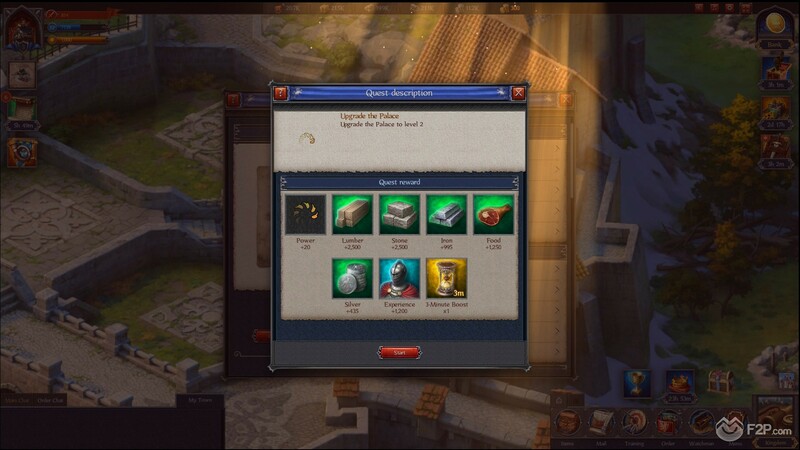 The quests themselves are pretty sub-par and don’t go beyond telling you to do things you’re going to do anyway; broken down into Building, Warrior Training and Studies (tech tree) they were little more than telling us to construct 4 farms, 4 quarries, 4 barracks, and then to upgrade a barracks to level 2, a farm to level 2, a mine to level 2, etc. 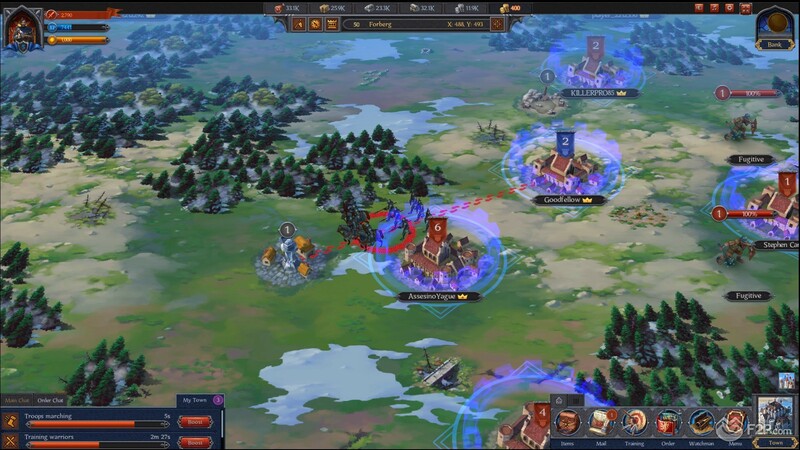 Once you level up everything to level 2 then your “quests” simply become leveling everything up to level 3, similarly, with the military quests it gave us individual quests to train 10 of each type of unit, once done it was a quest to train 25 of each type of unit. They were pointless and uninspired. The worst part about the early portion of the game is that all the early buildings have around a 5-minute timer to build them, and once a buildings construction time falls below 5 minutes you can rush it to completion for free (whereas normally it would cost a booster which can be earned or purchased). 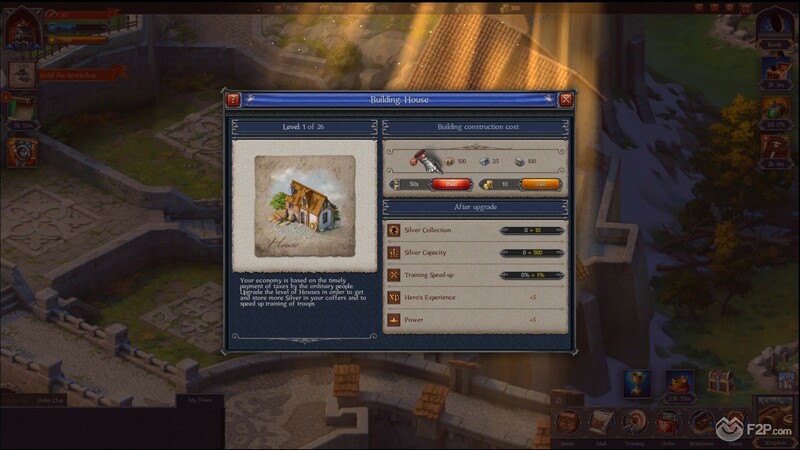 So all our early buildings were being built and speed completed one after the other, so the “gameplay” just became a lot of pointless clicking and a really tedious and boring experience, we see no reason why the game couldn’t say “Well it looks like you’ve mastered how to construct and upgrade buildings, let’s get our workers to construct the rest for you” and just immediately upgrading everything so you can actually start playing! Whilst the building construction took time, the “Studies” element was the biggest time sink, with new techs taking around 15 minutes to unlock it very much limited our own progression to access new features and units. The tech trees themselves are broken down into 5 different “branched” trees, which initially looks like it provides an element of customization to how you wish to advance your settlement. However, the techs constantly bottleneck into a single technology that requires all the three previous techs as pre-requisites, and so in turn requires the chain of techs that lead to it on a single branch, and so progression becomes pretty linear. The worst part for us is that certain elements of the game are locked behind a specific technology or feature; such as simply attacking a PVE Fugitive camp requires not only a technology is unlocked (albeit it takes 44s to learn that tech, which again is completely pointless and you might as well just start with it), but you also have to be part of an Order, i.e. a guild. Now you have two choices here, make an Order yourself (which costs 1000 gold and is a premium currency) or you can join an Order; “Open” Orders can be joined without application so essentially the game forces you into a group to complete BASIC features of the game, even if you don’t want to or want to find the right Order for you. We get that players will get more from the game by joining an Order, but to force players into one just to complete vs AI quests is just ridiculous. 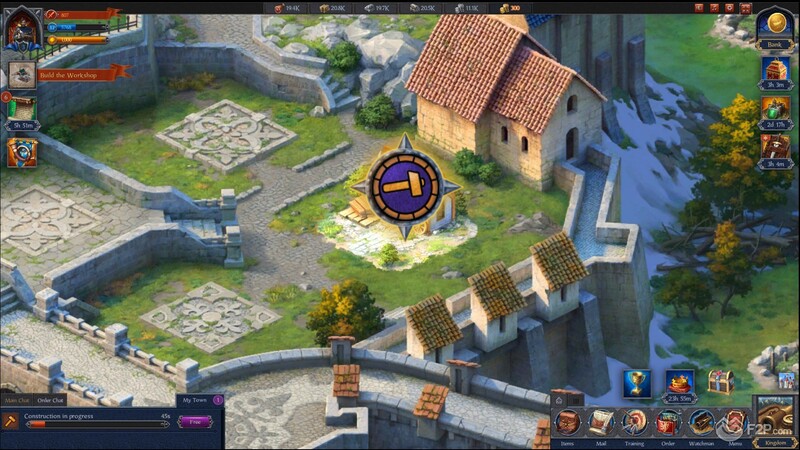 Overall, for a city building strategy, the game is up there with some of the better titles, and even with its poorer up close graphics quality Throne: Kingdom at War is still miles ahead of the competition. Outside the forcing your hand at every chance they get, the biggest let down is that the developers still haven’t evolved combat beyond the automated “choose your units to send into combat and then receive a battle report”, which is about as strategic as the game gets, unfortunately. 22 Comments - "First Impressions on Throne: Kingdom at War"
Yes, you can’t see a combat. It’s a disadvantage. But order’s life so addicting. Especially politics and communication in kingdom. Tnx for review, I’ll download it! I like graphics and settings. Game is not bad. But I don’t understand why I should pay silver to the king. Explain it, please. Andy, he captured the Eternal Stronghold. It’s a game’s functionality. Just send silver to your bank. Johnny93, you are attacker, right? I have just 2 barracks, that’s enough for me. I recommend to build Houses. It makes faster training troops. Awesome last update. I like coins! Hey folks! What do you think about studies? What I should upgrade the first? The first studies are the economic studies, this is the most important for the newbies. Hey, guys! Has anybody opened t6? Not yet, but i’m trying. Lol! I’m dreaming about Kraken! Wtf. I was zeroed during OVO. Bt it happened due to bad trap. In Throne: Kingdom at War now you can find a lot of gold. That’s fact! You just need strong order. No problems. Good game gone gone bad.. A lot of multi account users that feed off themselves to grow big. Stay away from the game and Plarium games in general. The biggest part of the game are Events mainly order vs order and kingdom vs kingdom… can’t win against an army of alts feeding off one another. Two thumbs down.